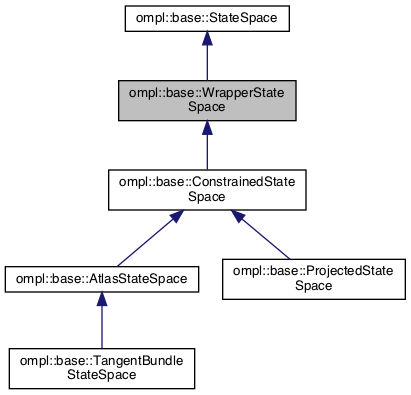 State space wrapper that transparently passes state space operations through to the underlying space. Allows augmentation of state spaces with additional information. Definition at line 99 of file WrapperStateSpace.h. Definition at line 269 of file WrapperStateSpace.h. Definition at line 249 of file WrapperStateSpace.h. Definition at line 322 of file WrapperStateSpace.h. Definition at line 137 of file WrapperStateSpace.h. Definition at line 392 of file WrapperStateSpace.h. Definition at line 213 of file WrapperStateSpace.h.